Back in high school, I saw the blockbuster summer thriller, Jaws. I have never been the same. Summer camp on Lake Saranac revealed my irking irrational fear that some crazed person had caught and released a shark into the lake to wreak havoc on us unsuspecting campers. Years later when my new husband and traveled by boat into deep waters to snorkel in the Florida Keys, I noticed a woman on board reading a book about sharks. Then the snorkel guide reassured us not to worry if we saw a hammerhead shark while we snorkeled because thus far, he had never hurt anyone. I was so filled with fear that I insisted my new husband paddle one handed so he could use the other hand to hold mine! Another famously British phrase, “Keep calm and carry on,” encourages us to stay in control — and some of us (preaching to myself here) are quite good at trying to control everything and everyone around us. Why? Because we worry about possible negative outcomes. Finally, mulling over and replaying the record of our worries may lead to anxiety attacks and possibly end in full blown phobias. Sadly, this principle applied to my waistline, but here’s a profound application simply stated; we either feed our fear (worry, anxiety, propensity to try and control our personal world) OR we feed our faith. Every day, every week, every month, every year we feed one or the other. And at the end of our lives we either tip the scales on one side or the other — more fear and its counterparts — or more faith. I don’t know about you, but I choose to feed my faith. The 23rd Psalm says that the Lord prepares a table for me, even in the presence of my enemies. So I invite you to come dine with me on God’s word, and subsequently turn our backs on the enemies of fear, discouragement, worry, anxiety and a host of other hostile invaders. 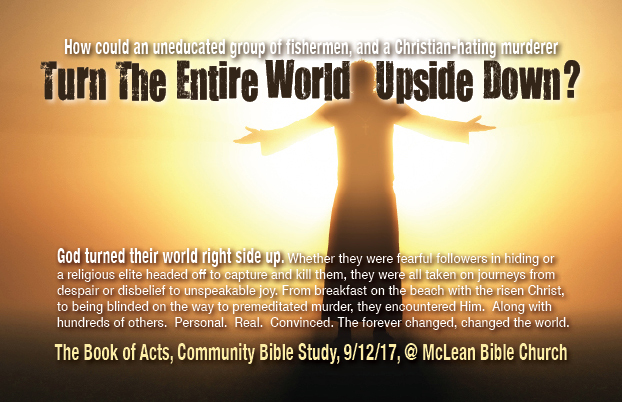 McLean Women’s Community Bible Study begins delving into The Book of Acts on Tuesday, September 12th – 9:25 to 11:25. It only takes two hours Tuesday morning to feed our faith within a small group followed by a stellar lecture, then less than a few hours “dining solo,” digging into the next lesson on our own. What will you feed this fall — fear or faith? Consuming an endless barrage of bad news or tucking into a time of real encouragement and hope that does not disappoint? I lay odds that you will love feeding your faith with Community Bible Study. And according to 1 Corinthians 13:13, faith always comes with heaping side orders of hope and love! I gave up scary movies long ago after seeing the effect they had on me. I started CBS shortly thereafter. Again, I’ve never been the same. But I’ve never felt better. Watch: This 6 minute video starts simply; doing small things well leads to doing bigger things well. As US Navy Admiral William McRaven continues, he reveals the power that one person, singing in the darkness, has on he and his fellow US Navy SEALS surviving Hell Week. Growing In Love Application: We never know how one small act of kindness might be used to keep someone from sinking into discouragement, worry, anxiety or fear. (kind of like how the solitary SEAL singing in the dark encouraged the others to keep going) Invite someone into the “Sure Thing” of Community Bible Study! Share this post on your Facebook page with an open invitation to find and visit any class in the USA or around the world. If you prefer a more personal touch, email the link to the attached postcard to someone who might be ready to try CBS with you!